The 76th Hahnenkamm Races marked the anniversary of „50 Years of Alpine Skiing World Cup“. Building on the pioneering spirit of their ancestors, the past and present, Organizers of the international Hahnenkamm Races are presented with an incredible challenge every year: maintaining great tradition whilst endeavoring to realise visions of the future. 87,000 visitors over three race days Around 87,000 visitors were counted at the Hahnenkamm Races, with around 20,000 on Friday, 45,000 on Saturday and 22,000 on Sunday. 120 hours live TV coverage Media interest in the Kitzbühel Hahnenkamm Races is enormous: 22 TV stations in Europe alone broadcast live coverage of the Hahnenkamm Races. Eurosport screened live images to all European countries and Eurosport Asia delivered reports on all the sporting action from the Streif and Ganslernhang to the Asian states. In America, sports broadcasts from Kitzbühel could be seen both live and in time-delay modus on NBC Sports. Some exotic” channels were to be found amongst the worldwide TV stations reporting live from the Hahnenkamm Races: SBS in Korea, J-Sports in Japan and Globosat in Brazil. Millions saw the thrilling TV images from Hahnenkamm. On Saturday evening in particular, just about every TV station in the world screened pictures of Kitzbühel and the Streif winners in their newscasts and sport Bulletins. A mix of snowfall, low temperatures and sunshine Snowfall at the weekend was followed by sunshine and freezing temperatures, which peaked at around 20 degrees below zero during the Race Week, with intermitted flurries of new snow. Friday was the best day of the whole week, with bright blue skies, sunshine and around minus 15 degrees Celsius. Sunday’s weather: initially better than anticipated, snowfall in the morning and the expected weather window opened up around noon. The Downhill race was postponed for an hour because of strong winds in the upper racecourse section and the start line was repositioned to the Mausefalle. Sunday morning started with dry, winter weather and both Slalom runs could start on schedule. Hahnenkamm Juniors – premiere for the Dutch team Supporting young talent has always enjoyed high priority at the K.S.C. The Hahnenkamm Juniors, traditionally held on the Wednesday of Race Week is therefore an important competition for the upcoming generation of new ski talent. Ten teams from eight nations joined the start line on the Ganslernhang Slope, including a team from the Netherlands for the very first time. The competition consists of a Giant Slalom and Slalom. At halftime, it looked as if the Germans were going to be the surprise winners – but the Austrians delivered a sterling performance in the Slalom and secured the winner’s title for themselves. Training runs carried out as planned The first training run was held as scheduled on Tuesday. 21st January. French athlete, Adrien Theaux, won 21 hundredths of a second ahead of Hannes Reichelt and Aksel Lund Svindal (NOR). Max Franz fell in the compression and suffered a knee injury. The Italian athletes dominated the second training run on Thursday, 21st January. Mattia Casse surprised everyone, finishing fastest with the high start number of 47, relegating his compatriot Christof Innerhofer to second place 0.34 seconds behind. Third and thus best Austrian was Vincent Kriechmayr (+ 1.03), who nonetheless missed a gate. Tyrolean athlete, Florian Scheiber, took a tumble in the Traverse, suffering a ruptured cruciate ligament and meniscus tear in the process. Super-Friday with the Super-G and Combined-Slalom Sunshine, blue skies and temperatures of around – 15 degrees Celsius: the Super-G basked in perfect conditions and got off to a thrilling start. For a moment, it looked as if it was going to be a triple win for the Italians in the Super-G with Peter Fill, Mattia Casse and Dominik Paris – until Andrew Weibrecht took the lead. Top favourite Aksel Lund Svindal shaved another 0.31 seconds off the American’s time and snatched the Super-G title. Austria’s Hannes Reichelt came in third. Hahnenkamm-Combined: triple win for France Hat trick for Alexis Pinturault: The Frenchman dominated the floodlit Combined-Slalom, winning the Hahnenkamm Combined for the third year in succession. His teammates, Victor Muffat-Jeandet and Thomas Mermillod-Blondin brought up the rear in second and third place. Marcel Hirscher suffered great disappointment in the second run. After an excellent start the Salzburg athlete would have been in the lead, but unfortunately straddled a gate after a tricky transtition. His younger team colleague, Niklas Köck picked up his first World Cup points after finishing 22nd. Peter Fill is Kitzbühel’s 2016 Downhill Winner Strong winds in the upper course section caused the race start to be postponed by one hour. The start-line position was repositioned to the Mausefalle and the race started at 12.45 hrs. Peter Fill was the surprise winner, pulling off the second World Cup triumph of his career here in Kitzbühel. He later announced at the press conference that winning was a dream come true for him. With an outstanding run down the entire racecourse, the South Tyrolean asserted his superior athletic prowess, ahead of Swiss racers Beat Feuz (2nd) and Carlo Janka (3rd). The focus, however, was not just on the victorious athletes, but also on those who unfortunately fell during the race. Georg Streitberger and Hannes Reichelt had to be flown by helicopter to St. Johann Hospital after falling on the Hausberg – Streitberger suffered a cruciate ligament injury, Reichelt a bruised bone. Aksel Lund Svindal, who fell in the self-same section, was able to walk away from where the accident occurred, but suffered a cruciate ligament tear and ruptured meniscus. The FIS-Jury was then faced with a difficult decision: the approaching weather front forced those responsible to halt the race after only 31 athletes had competed. During the next Team Captain’s Meeting, FIS Race Director, Markus Waldner, explained the Jury's decision in detail. The predicted weather "window" at lunchtime prompted the Jury to postpone the race for an hour. Repositioning of the start-line to start position one, above the Mausefalle, was a joint decision made by all the coaches and made absolutes sense, as wind and visibility were very good at 12:45 hrs, said Waldner. With regards to the athlete's falls, he clarified that he inspected the Hausberg racecourse section personally and the slope was in good condition - the Hausberg is simply a point in the race where the tiniest mistake can lead to a tumble. The decision to stop the race after 31 racers was ultimately made for the safety of the younger and less experienced athletes. Henrik Kristoffersen wins the Slalom Pure excitement at Ganslernhang: Germany’s Fritz Dopfer was in the lead after the first run, followed by Sweden’s Mattias Hargin. Austrian Marco Schwarz provided an unexpected surprise, finishing only 33 hundredths of a second behind the leader, just in front of Marcel Hirscher and Alexander Khoroshilov (RUS). The second run was an absolute nail-biter: Henrik Kristoffersen demonstrated exactly why he ranks as one of the world’s best all over again in Kitzbühel, delivering an incredible performance with start number 19 and forcing his way to the forefront with a lead of 1.25 hundredths of a second. Marcel Hirscher missed winning by a whisker, finishing in second place only three hundredths of a second behind. Germany’s Fritz Dopfer came third. Fringe Programme at the 76th Hahnenkamm Races Opening of the Race Week with monument unveiling Organizing Committee Chairman, Michael Huber, opened the Race Week on Tuesday evening in the Legends Park. The „Stein des Anstoßes“, a monument designed by Franz Pfurtscheller to commemorate the World Cup was unveiled in the Legends Park by Hansi Hinterseer, Olga Pall and Hanni Wenzel-Weirather . After the official “marching-In” procession of the participating nations, Michael Huber welcomed those taking part in the Hahnenkamm-Juniors to Kitzbühel. Discussions then took place in Kitzbühel Museum with “contemporary witnesses” to mark the anniversary of „50 Years Ski World Cup“. The panel included Olga Pall, Hanni Wenzel-Weirather, Hansi Hinterseer, Stephan Eberharter and sports scientist, Michael Huber, and ORF sports writer, Fred Lentsch, was moderator. The panel looked back on their active sporting careers and compared the past with the present. They all agreed on one particular fact: Kitzbühel Ski Club contributed significantly to the foundation and development of the Alpine Ski World Cup and repeatedly set new and innovative standards. Kitzubühel Museum devoted a special exhibition to celebrate the occasion of the “Birth of the Ski World Cup 50 Years Ago” at the Seidlalm in Kitzbühel. Reunion of Ski Legends One Event on Thursday of Race Week has great tradition: K.S.C. invites former winners of the Streif and Ganslernhang to a Reunion of Ski Legends every year in Kitzbühel. 23 former Kitzbühel winners accepted the invitation to attend this year, including Marc Giradelli, Sepp Ferstl, Peter Wirnsberger, Leo Stock, Egon Zimmermann, Didier Cuche, Daniel Mahrer, Mario Matt, Manfred Pranger, Hans Knauss, Michael Walchhofer, Dumeng Giovanoli, Benni Raich, Günther Mader, Fritz Strobl. Reception by the Tyrolean Provincial Governor The town band, “Schützen” home guard and many guests of honour: The Governor of Tyrol, Günther Platter , hosted a welcoming ceremony in Kitzbühel’s town centre. A whole host of distinguished guests accepted the invitation to attend, including Agricultural Minister, Andrä Rupprechter, Governor of Lower Austria, Erwin Pröll, Presidential candidate, Andreas Kohl, Kitzbühel's Mayor, Klaus Winkler and ski legends, Ernst Hinterseer, Karl Schranz, Mario Matt and Manfred Pranger. Reception by ÖSV and K.S.C. The joint reception hosted by ÖSV and K.S.C. before the start of the Downhill Race enjoys great tradition – as is honouring the personalities who have contributed outstanding services to the Hahnenkamm-Races. The World Ski Awards was dedicated to all members of the legendary Kitzbühel Wonder Team (Christian Pravda, Toni Sailer, Anderl Molterer, Ernst Hinterseer, Fritz Huber and Hias Leitner), who won all the world’s major ski events in the 1950s. K.S.C. President and Chairman of the Hahnenkamm Races Organizing Committee, Michael Huber, presented an honorary award in the form of a special brooch with certificate to the “ARGE” consortium partners of the Hahnenkamm Races, which was accepted on their behalf by Josef Burger (Bergbahn AG Cable Car Co Kitzbühel), Signe Reisch (Kitzbühel Tourism) and Klaus Winkler (municipal authorities). Patrons of this Kitzbühel event were also presented with the same award: Tyrol’s Provincial Governor, Günther Platter, and Federal Chancellor, Werner Faymann, who first arrived in Kitzbühel, however, for the Slalom on Sunday. Anneliese Schuh-Proxauf (Hahnenkamm winner of 1946) and Princess Gabriele of Leiningen were welcomed to the reception as special guests of honour. Team Generali wins KitzCharityTrophy Team Generali with Günter Mader, Arno Schuchter and Jimmy Steiner accepted the golden "Kitz-Gams" trophy with much jubilation. Team Gösser with Michael Walchhofer, Michaela Dorfmeister and Hans Knauß came second. The winners of 2015, Team Toro Rosso, with Carlos Sainz, Fritz Tost and Max Verstappen only managed to achieve third place this year. Proceeds go to the benefit of Tyrolean farming families, who have fallen on hard times through no fault of their own. Improved town centre concept The Fan Zone in the town centre should enjoy the same quality standards of those at the Hahnenkamm Races event venue. A specification that requires constant revision. The stalls offered various pleasures of the palate; the prices were moderate. The maximum price limit for soft drinks was set at Euro 2.50. Sound quality and accessibility were both imporoved. Twenty PA towers flanked the fans as they made their way through the town to the event area. Five video walls with sound-system were positioned in the town centre and a special fan TV team interviewed spectators to gauge the mood. Information was conveyed to all spectators in the race area as well as the centre of town at the press of a button, while video walls screened the latest happenings from the finish area. MasterCard provided an on-site payment system for the first time this year. “Thanks to MasterCard, guests now have the opportunity to pay without cash at all important Touchpoints at the event. 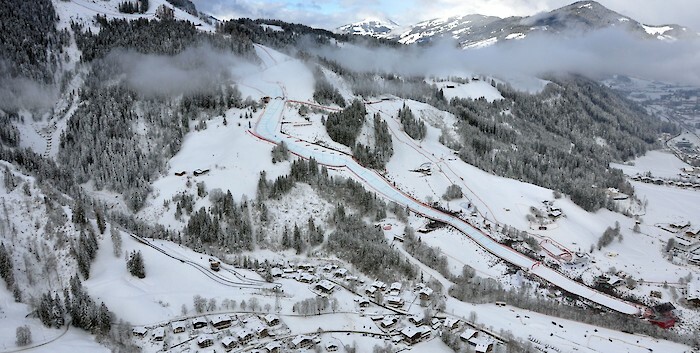 The Hahnenkamm-Races really do keep setting new standards in service quality”, says Michael Huber, President of the Kitzbühel Ski Club (K.S.C.). Furthermore, MasterCard provided lots of surprises and exclusive benefits at the races, for example, allowing spectators speedy access to the spectator area with the new Fast Lane. We look forward to seeing you again at the 77th Hahnenkamm Races from 19th to 22nd January 2017!